If you are one of the estimated 5.8 million Americans with fibromyalgia, you are no stranger to the difficulties involved in getting a good night's sleep. Fibromyalgia is cruel. Muscle pain and fatigue are two of the most common symptoms, but fibromyalgia sufferers find it almost impossible to get an uninterrupted night's rest. Your mattress could be part of the problem. Those of us with fibromyalgia can attest to the frustration of getting through an exhausting day full of aches and pains only to find a sleepless night awaiting us. If, like me, you have a loved one with fibromyalgia, then you also know how hard it is to watch that loved one suffer. Finding the right mattress is one way to improve your sleep. The wrong mattress irritates pressure points. The right mattress alleviates them. Memory foam mattresses are a good choice for those of us unlucky enough to suffer from fibromyalgia. The foam cushions the body while also providing support. Gel memory foam mattresses are another option. These mattresses supply the same support as regular memory foam without the hot feeling that sometimes accompanies memory foam. Gel and memory foam mattress padding is a lower cost solution for those of us on a budget. It is tempting to choose a super soft mattress. Soft mattresses seem comfortable at first. We sink right into them, but this is actually a problem. Fibromyalgia patients need supportive mattresses to prevent back and joint pain. This means that mattresses that are too soft put pressure on the spine and back, which aggravates muscles and joints. What Are The Best Mattress Types For Fibromyalgia Patients? I have found that memory foam, gel foam, and innerspring mattresses work for my loved ones. Unfortunately, there is not a definitive best mattress for fibromyalgia. Each of us is different and since fibromyalgia can present in a variety of uncomfortable ways, your mattress choice is personal. Memory foam was originally designed by NASA to cushion astronauts during take-off and landing. The material hugs the body while also providing support. This makes it an attractive option for patients suffering from chronic pain and fatigue conditions. he one drawback to memory foam is that the mattress heats up on the surface. This is uncomfortable for those of us with trouble regulating body temperature. Higher density foam tends to heat up faster than lower density. Gel foam mattresses are similar to memory foam mattresses in comfort and support. The difference is that gel foam has gel liquid or gel beads incorporated into the foam. This technology absorbs the heat of our sleeping bodies. It doesn't just prevent the mattress from feeling hot. It lowers the sleeping surface temperature by five degrees. Spring coil mattresses are probably the most common mattresses sold in stores. Older innerspring mattresses are less comfortable than newer ones. Competition from memory foam forced traditional innerspring mattress companies to come up with newer, more comfortable technologies. This is great news for those of us looking for the best mattress for fibromyalgia. The support offered by an innerspring mattress is usually adequate, especially when paired with a memory foam mattress pad. Memory foam mattress pads help make our mattress more supportive. Since the cost of a brand new mattress is often astronomical, a pad is a good place to start. Memory foam pads do not supply as much support as a memory foam bed. They do give you a feel for the technology. Gel foam mattress pads are also available for those of us who prefer a cooler sleeping temperature. As with memory foam, trying out a pad is a good way to determine if the material works for you before investing in a mattress. Latex foam toppers are more expensive than memory foam and gel foam. They also lack the chemicals and are made of natural materials and are cooler than memory foam. Mattresses are an investment. Anyone who has trouble sleeping knows that the price is well worth it. Still, we want to make sure we buy the best mattress for our fibromyalgia. Since we can't spend the night in the mattress display room, we need to know how to choose a mattress that works for us. Some mattress companies provide buyers with a trial period. This is very helpful for fibromyalgia patients as it allows them to try the mattress at home for an extended period of time. One night or even two nights is not enough time to determine if the mattress makes a difference. Look for companies that offer longer trial periods. This indicates an assurance of quality as well as buying you time to make up your mind. Fibromyalgia makes it difficult to accomplish simple tasks on bad days and installing a new mattress is far from simple. Hauling a mattress upstairs or dealing with the weight is a lot for one person. Look for companies that offer to install the mattress for you. Don't be afraid to try multiple mattresses to find the one that works best for you. Sleep Innovations carries a 12-inch memory foam mattress that comes with a 20-year manufacturers limited warranty. The memory foam is made in the U.S., unlike many options available online. The density of the 2.5 inches of top layer memory foam is 3 pounds. This is on the lower end of the density scale, meaning it is more soft than firm. Beneath the memory foam is 9.5 inches of support foam to provide therapeutic support without the discomfort sometimes associated with innerspring mattresses. It also comes with a poly cotton mattress cover and ships rolled and compressed. Be sure to allow time for the mattress to decompress and air out before use. This mattress from Signature Sleep is available in 6, 8, and 12-inch thicknesses. The density of the memory foam is 4 pounds, which is firmer than the 12-inch mattress from Sleep Innovations. It also comes with a warranty. The warranty is only one year and does not include comfort preference. The 4-inch, 9 ILD memory foam provides support for hips, shoulders, the spine and other pressure points. It is manufactured in China. The 4-pound density is a deciding factor for fibromyalgia suffers as it determines the amount of support. If 3 pounds did not give you enough support, then 4 might be a better option. As with any memory foam, the mattress can get hot over the course of the night. Brentwood Home carries a gel memory foam mattress for those of us who prefer sleeping on cooler surfaces. The 13-inch mattress consists of 3-inches of gel memory foam, 1-inch of their Extra Comfort Layer, 2-inches of a Cool Airflow Layer and a 7-inch base made of therapeutic foam. The gel cools the sleeping surface while the foam offers support. The top layer of the mattress is lined with a natural wool layer to provide a healthy sleeping surface. Wool naturally wicks away moisture and regulates body temperature for added cooling. The mattress is antimicrobial, resistant to dust mites, and hypoallergenic. The cover is removable and washable, and the mattress is manufactured in the U.S. The manufacturer offers 25-year limited warranty. Sleep Joy makes a memory foam mattress topper that claims to be ventilated to combat the heating effect of the memory foam. 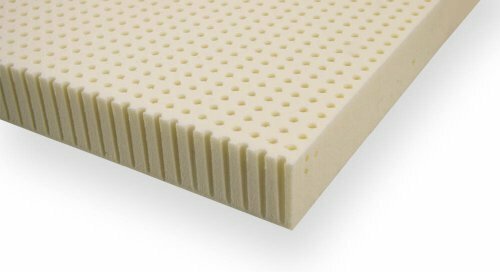 The 2-inch thick memory foam is manufactured in the U.S. and the manufacturer enhanced the open-cell memory foam with plant-based materials to limit the environmental impact. This topper won't fix an old or cheap mattress, but it can be a solution for boosting the comfort level of your existing, high-quality mattress. 2" of memory foam is enough to help your mattress cushion pressure points. It allows you to experience memory foam without replacing your entire mattress. This foam topper is a good choice for very firm beds that help with back pain but trigger pressure points. This mattress topper might give your existing bed the support you need at night. The 3-inch latex topper comes in three thicknesses: soft, medium, and firm. Latex provides more support than memory foam and is naturally cooling. It is also significantly more expensive. This topper comes encased in bamboo. Bamboo is a natural fiber and very breathable, assisting your body's temperature regulation. Latex is a natural material, which is appealing to fibromyalgia sufferers concerned about some of the chemicals found in memory foam. The Talalay latex is a blend of latex and synthetic materials, but 100% latex mattress toppers are certainly available from other manufacturers.